When I was a kid I never ate breakfast. Even the thought of having to eat before school made me sick. My mom knew how I felt and in the beginning she offered me cacao “to get something warm into your body” but even that was too much for me. Well, these times are over now. During the last few years, breakfast became one of my favorite meals of the day. Whenever we had plenty of time, my boyfriend and I would indulge in waffles, scrambled eggs with sautéed tomatoes and onions on the side, freshly squeezed orange juice, cheese, jam, honey, tea, croissants, bread, muesli, cereal, … Basically, we put everything we could find in the fridge and pantry on the table and enjoyed what we craved most at that moment. Here in Copenhagen I have to get used to cooking for one person again. And I’m telling you, it’s not as easy as it sounds. At home we cooked fresh meals every evening because for me that’s the best way to end a day: spend time together, cook delicious food, sit, talk and watch our favorite shows. For the past two weeks I cooked huge batches of spaghetti sauce or sweet and sour-sauce with pineapples that would last a few days. When I was hungry, I simply cooked some pasta or rice and was ready to go. That’s an easy way to get a warm meal in my tummy every day without spending too much time on cooking. The same goes for breakfast. Sometimes I have class at eight in the morning, and since this means I’m essentially sleepwalking to university, I can’t be bothered with a complicated breakfast. 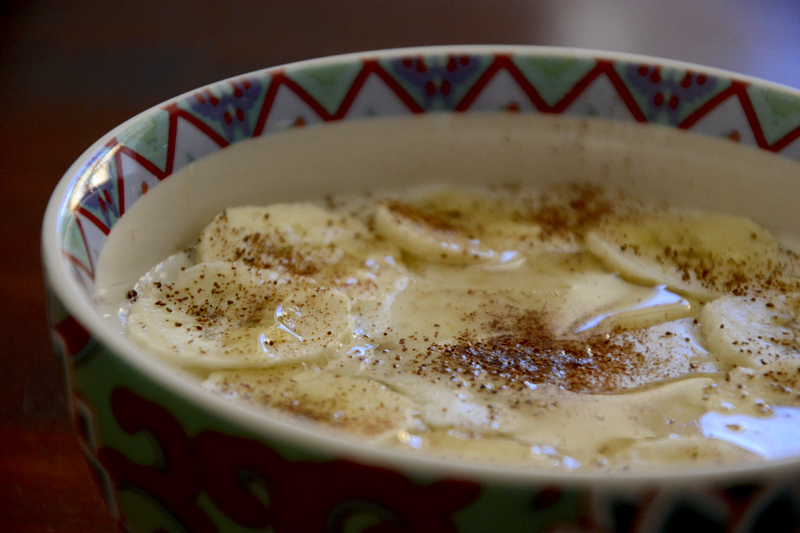 That’s why I love making myself a warming bowl of oatmeal, topped with banana, honey and cinnamon. 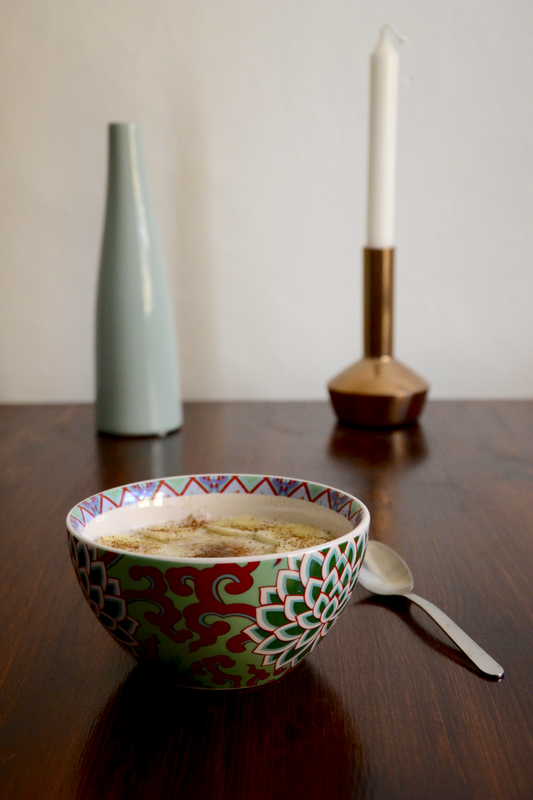 It only takes five minutes to prepare, doesn’t cost much, is a healthy way to start your day and warms you from the inside (I need that as I’m constantly freezing here!). Mix oatmeal and milk in a small saucepan. Heat up and let it cook for about five minutes or until the oatmeal thickens just a bit (it will thicken up more once you pour it into your bowl). I try not to use too much heat as it only makes the oatmeal stick to the bottom of the pan much quicker. Usually, I heat it just to the point where I can see the mixture move just a tiny bit in the pan. Also, don’t let it cook for too long or it will get super slimy and disgusting. Don’t forget to stir or else you’ll have a hard time cleaning the pot afterwards. 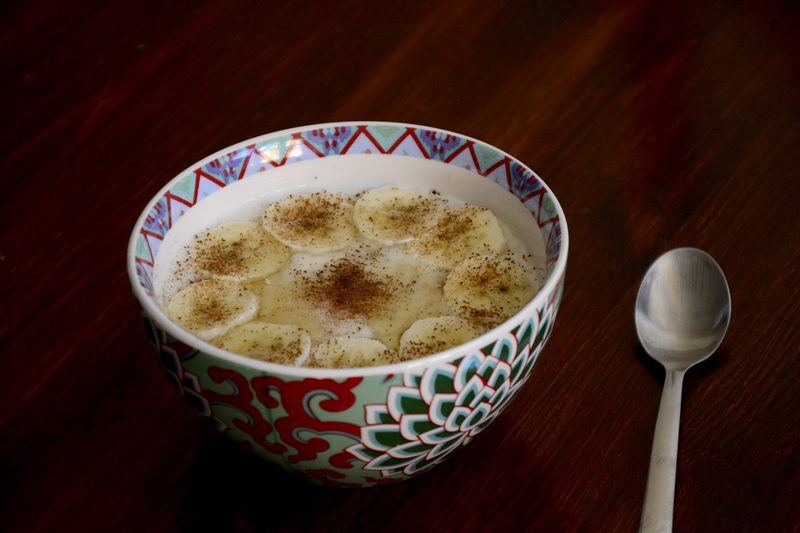 While the oatmeal cooks, cut the banana in small pieces and put them in a bowl. Add the oatmeal, honey and cinnamon, stir and enjoy!